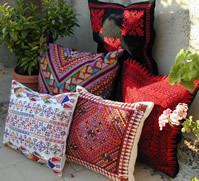 Traditional Bedouin cushion covers have a wool front and cotton backing. Handwoven on ground looms. 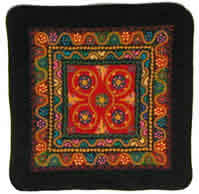 Made of 100% handspun sheeps wool. 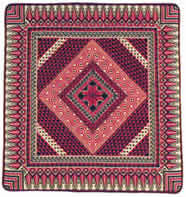 Sampler Cushion Cover A beautiful array of designs and colours on white background. Made by UNR. 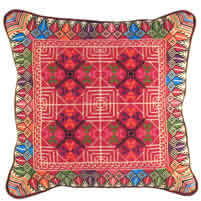 Cushion with Spider Pattern. In red on black. Made by UNR. 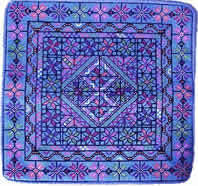 Rich Floor Cushion. Red on black. Made by UNR.